Anadrol is the 50mg tablet of the anabolic steroid oxymetholone, prescribed as an oral medication. 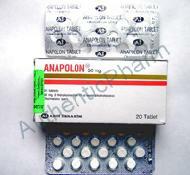 Anadrol is a potent anabolic and androgenic drug. Anadrol is one of the class II anabolic steroids, and these act without aromatization into other androgenic hormones (such as caproate in Omnadren, that aromatizes into estrogen and then acts in the body). The basic mechanism of Anadrol is to act through the liver; this is how class II steroids work. Mostly, testosterone increases the level of nitrogen in body and this enhances protein synthesis. In contrast to this mechanism, Anadrol (oxymetholone) boosts the excretion of erythropoietin through urine, and triggers red blood cell production. Anadrol is usually prescribed for patients with many kinds of anemia, for example acquired aplastic anemia, congenital aplastic anemia, mylofibrosis and hypoplastic anemia. Patients with anemia have bone marrow defects that inhibit erythropoisis (red blood cell synthesis), and are treated with this drug to enhance red blood cell synthesis to combat their deficiency. Anadrol also helps to stimulate the androgenic hormonal functions, which can give you the benefit of protein synthesis and muscle build up. Anadrol is also prescribed for patients with excessive weight loss, as it helps to gain weight and muscle via water retention in body. Anadrol is good for anemia patients, but it has very long term side effects, and these cannot be minimized when too much of the drug has been taken. The first and foremost side effect is the inhibition of testosterone and other androgenic hormones, which causes a negative effect on the normal regulation of body systems. It can prove to be toxic by causing excessive water retention in the body, and enormous weight gain reduces body strength. It increases appetite, hair growth, acne, headaches, and is toxic for liver function. It can produce tumors in the liver by blood clotting, and can cause hepatitis, jaundice, liver cancer and cirrhosis with its long term use.